In a large skillet, cook beef over medium heat until no longer pink; drain. 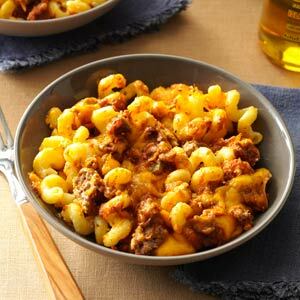 Stir in the taco seasoning, tomato sauce, green pepper, spices and MacYourself cheese powder. Bring to a boil; remove from the heat. Meanwhile, combine the pasta, 1/2 cup cheese and sour cream. Spoon into a greased 2-qt. baking dish. Top with meat mixture and remaining cheese. Bake, uncovered, at 350° for 30 minutes or until heated through.